This creative submission to the Schmidt Family Crest Design Contest is absolutely gorgeous. 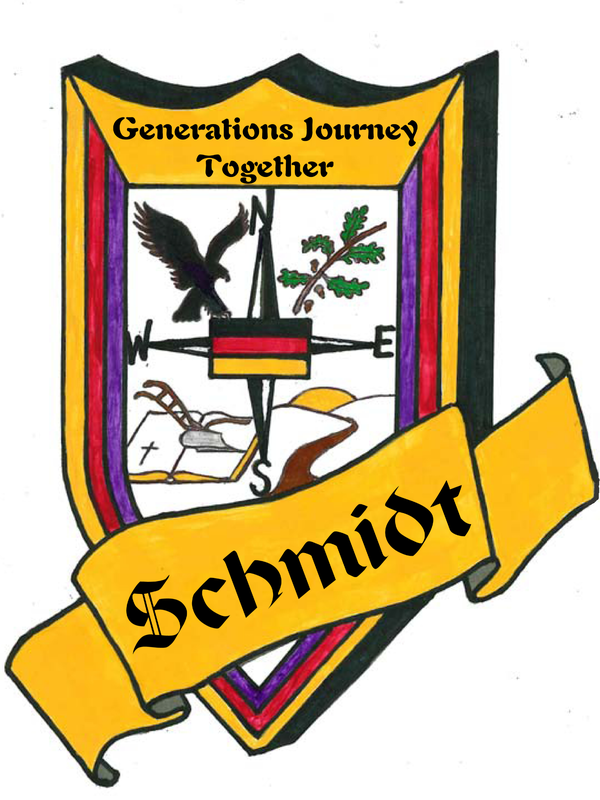 This crest tells the living history of our Schmidt Family as her members went from local to global. The outside bands of color represent the German flag – with one additional band of purple. The purple band represents those of us who joined the Schmidt family by choice – not by blood. The bands say, “It doesn’t matter how you got here; we’re all in this together”. The compass and flag in the center of this crest recognizes those who have stayed in Machtlos as well as those who have journeyed in all directions from Machtlos. The upper left quadrant— Whether they stayed or left, our family ancestors discovered that the eagle (a sign of bravery) is the national bird of both Germany and the United States. You can see that even though she is flying free, she is also firmly hanging on to her German heritage. The upper right quadrant— The leaves of the oak tree represent the strength and perseverance of generations – past and present. The lower left quadrant — The image of a plow is superimposed upon an open Bible. Both then and now, hard work is honorable when based upon strong values. The lower right quadrant — The unending road binds together those who wrote the Schmidt family history and those generations to come. The journey continues. Hence, the words at the top of the crest — Generations Journey Together. Sarah is the wife of Gordon Schmidt, daughter-in-law of Arnold Schmidt, granddaughter-in-law of Henry Schmidt Jr., great-granddaughter-in-law of Henry Schmidt Sr., 2xgreat-granddaughter-in-law of Conrad Schmidt, 3xgreat-granddaughter-in-law of Dietrich Schmidt Sr., 4xgreat-granddaughter-in-law of Johann Friedrich Schmidt, 5xgreat-granddaughter-in-law of Johannes Schmidt Jr., 6xgreat-granddaughter-in-law of Johannes Schmidt Sr., 7xgreat-granddaughter-in-law of Hans Heinrich Schmidt, and 8xgreat-granddaughter-in-law of Hans Schmidt. Thank You to Keith and Renee Anliker!